perfect!!!!! luks spongy...never treid..will surely try it.. 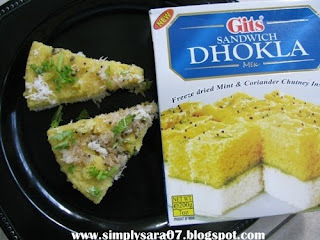 Delicious sandwich dhoklas, looks very yummy..
Is it a new product? I do not know about this. 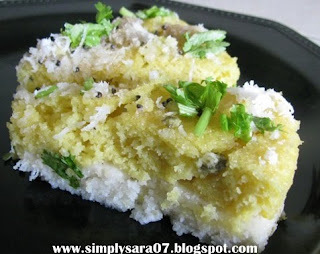 May be my kids will like it, they do not like normal dhokla! The dhoklas look delicious. I have not tried the sandwich dhokla but have tried several of their varieties-as they had given me several samples when I visited them in Pune. All their products turned out great!! Hello dear...first time to ur blog. u have a nice collection of recipes. The dhokla looks great and yummy.